← King Arthur and the Roman What?? And so within twelve days they come to Camelot, and the Kynge was passing glad of their commyng, and so was all the court. Than the Kynge made hem to swere upon a booke to telle hym all their adventures . . . (111). I followed Malory’s indication and went to Winchester. I had been to Winchester the previous year where a carving I had seen began to work upon my imagination. I returned to the Cathedral to take photographs of the pointing hands (known as “manicula”) carved into an exterior stone wall and to think about the connection to the manicula that are in the margins of the Malory manuscript, spectacularly discovered in 1934 at Winchester College, a private boys’ school near the Cathedral. the visually-engaging 13th century Round Table on display in the Great Hall (See Jon Whitman’s prize-winning essay “National Icon: The Winchester Round Table and the Revelation of Authority” in the journal Arthuriana 18:4, Winter 2008.). 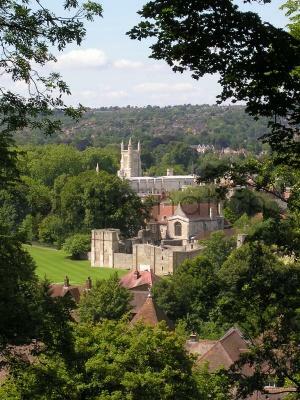 One can see why Malory would have favored Winchester as a possible site of Camelot— it is the perfect mingling of English and Roman military grandeur that would seem the right fit for the fifth century Arthur. By Malory’s time, in the mid-1400s, traces of the former Roman presence still remained–evidence of a Roman fortification on St. Giles Hill and beautiful roman floor mosaics, still visible today. 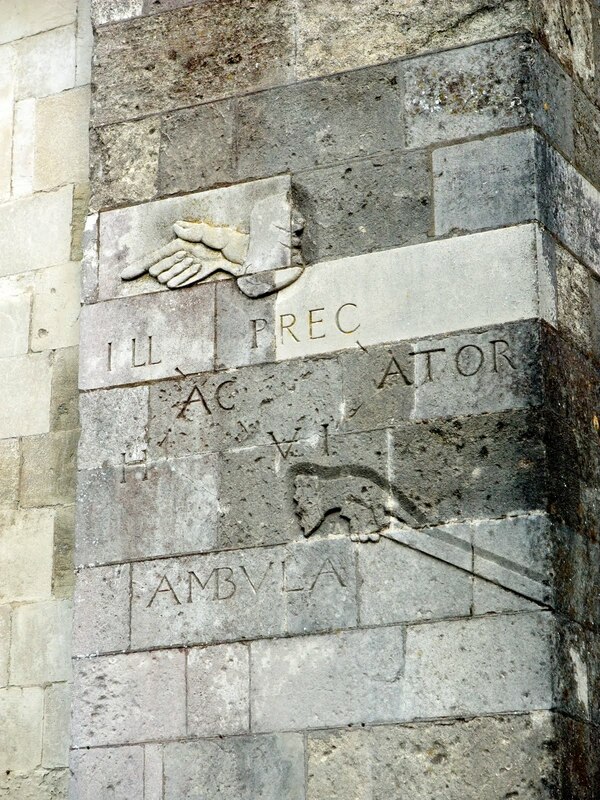 The name Winchester itself seems to arise from a mingling of English and Roman cultures: the older form, Wintanceaster—is a combination of the Latin word “Venta” (perhaps meaning market) and “ceaster,” the Old English word for fortified town . Rushing through the Waterloo train station in London to catch the train to Winchester, I glanced up and caught the light, angled like the revelation of divinity, streaming across the station concourse, alive with particles, turning dust to dreams. Amid my own personal uncertainty, came sheer happiness—Winchester bound. *All quotations are from Le Morte Darthur, edited by Stephen Shepherd.